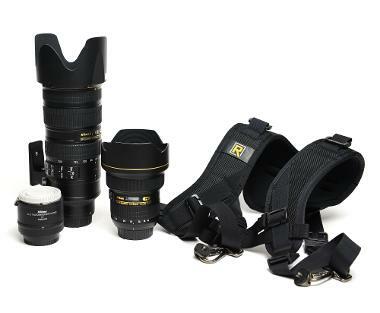 The Sports Photography Essentials Package for Nikon provides photographers with an easy solution for a lightweight setup suitable for indoor/outdoor sports shooting. The Nikon 70-200mm f/2.8 VR II is fast enough for most indoor lighting situations, like basketball courts, which is helped by the added vibration reduction. The extender provides twice the amount of reach when attached to the 70-200mm, making it an effective 140-400mm lens on a full-frame sensor (approximately 224-640mm on a crop-frame sensor). This is handy for outdoor sports shooting where you are not allowed to get close to the action, such as at race tracks or football games. Use the vest-like Black Rapid Double Strap to easily carry two camera bodies--one for your long lens and the other for the Nikon 14mm-24 f/2.8, which is wide enough for environmental/scene context shooting and fast enough for indoor sports as well. The Black Rapid Double Strap is adjustable and suitable for broad-shouldered individuals. • Nikon TC-20E III 2x Teleconverter. • BlackRapid RS DR-1 Double Strap.